A property management software program that allows you to enter a lot of data isn’t very useful, if you can’t easily use that data to create reports. With that in mind, we have created the most user-friendly property management software that allows you to create your own reports using any combination of information. 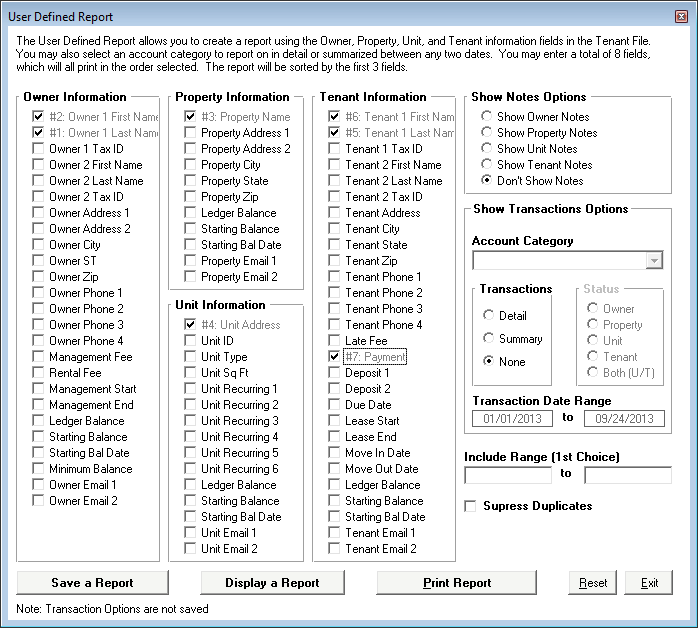 Instead of only being able to choose from a short menu of reports, our USER-DESIGNED REPORT feature, which is unique to Tenant File, allows you to custom create reports using any of the information that you have entered into the system. We made it very simple to create your reports. Just click on any criteria from a listing of fields, select the order in which you want the information sorted -- and the report is automatically generated. You can also pull information from transaction ledgers and include income and/or expenses between two specified dates. When you need information, we make it easy to get that information fast. Property management software that allows you to create your own reports is great, but we take it a step further by also allowing you to choose the sort order. Want to sort by last names of tenants? Want to sort by dates? Want to sort by zip code? You can do it with our software. This feature makes it even easier to get the exact information that you need. For example, you can sort by “current balance.” This will provide you with a list of tenants, starting with those who owe the highest balances. Next, you can save the reports that you create and use them next time without having to set them up. This will save valuable time for you and your employees when needing information quickly. As you can imagine, there are many ways that our property management software that allows you to create your own reports can be useful. No longer will an assistant need to comb through hundreds of pages of data to get the information that you want. Instead, all of the reports that you’ll ever need are just a few mouse clicks away. The Tenant File also provides a space for you to add notes to your reports if you wish. If you haven’t yet tried Tenant File, then you will be amazed at how much easier our software will make it to run your property management business. Give us a call, today, to learn more about all of the software options that we offer.